Date Built: 1953 by - J Prowles Boat Yard of Wroxhan. taking visitors around the harbour. 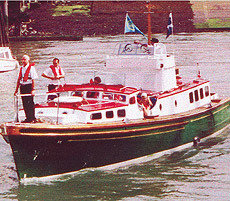 The Green Parrot was one of three boats ordered on J Prowles Boat Yard of Wroxhan, she was modified and finished as a barge for C in C Home Fleet Sept 1956 on board HMS Maidstone. Her recorded acceptance date is 1/10/56 being issued to C in C Home Fleet later that month. She was later used in the same capacity on board HMS Tyne in Feb 1959. 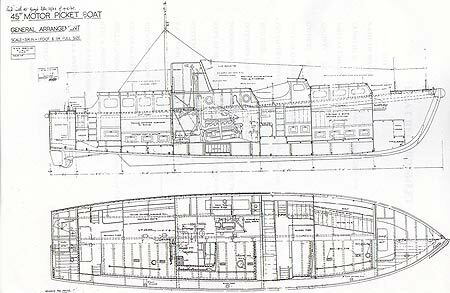 In 1960 approval was given to transfer her to C in C Portsmouth (Naval Home Command) subsequently being taken onto account as C in C’s barge. It was in this guise that she was named ‘Green Parrot’ and as well as being used by the Admiral Superintendent she was also used by Her Majesty Queen Elizabeth II as her Royal Barge during state visits to Portsmouth. 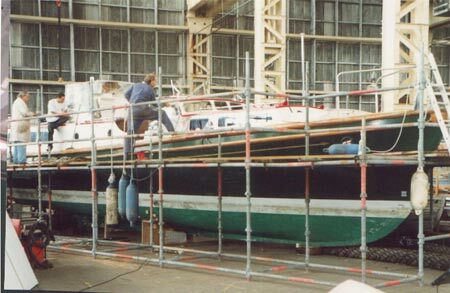 The Green Parrot was taken out of service and had been due to be scrapped when she was gifted to the PNBPT by the Admiral Superintendent in 1996, since then she has undergone a programme of maintenance and conservation. 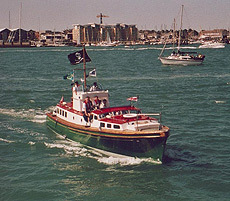 for the First Festival of the Sea hosted in Portsmouth in 1998.